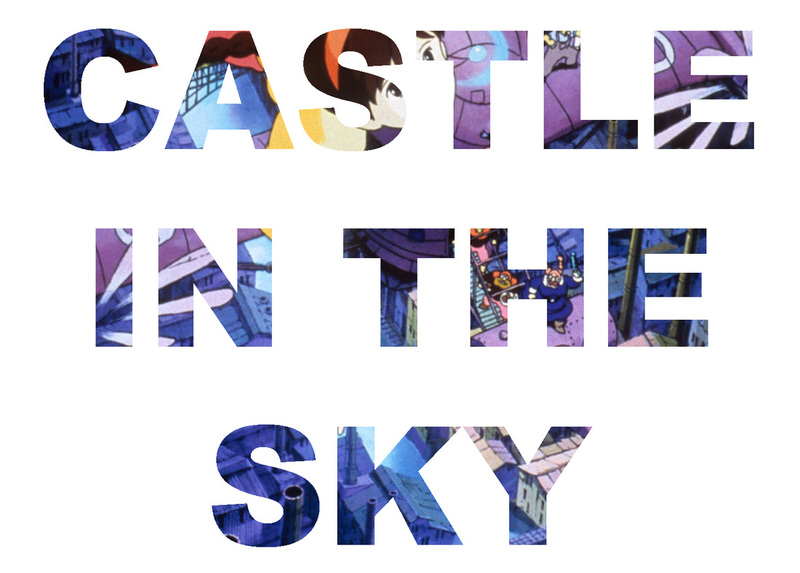 This article is a review of CASTLE IN THE SKY. “Oh yes Pazu, the Earth speaks to us; and if we listen we can understand” Uncle Pomme. 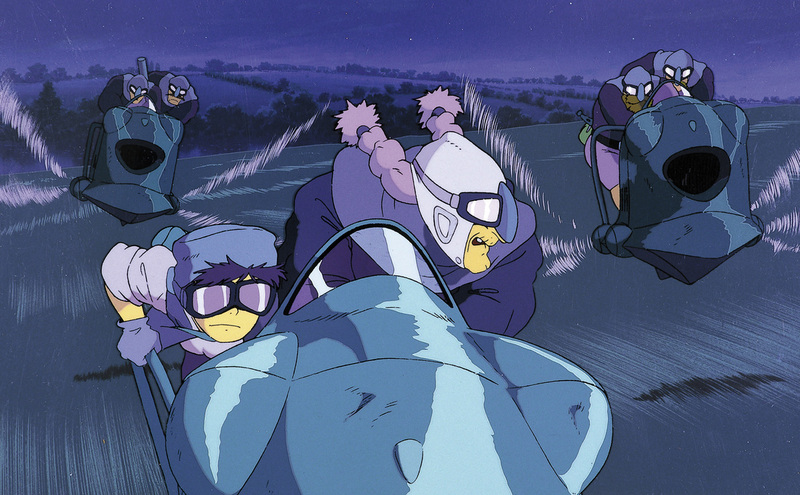 Could this 1986 film be one of the greatest animated features of all time? It surely must be in the running. Studio Ghibli, under the auspices of co-founder and brilliant writer-director Hayao Miyazaki, is a force of nature in the world of cinema. 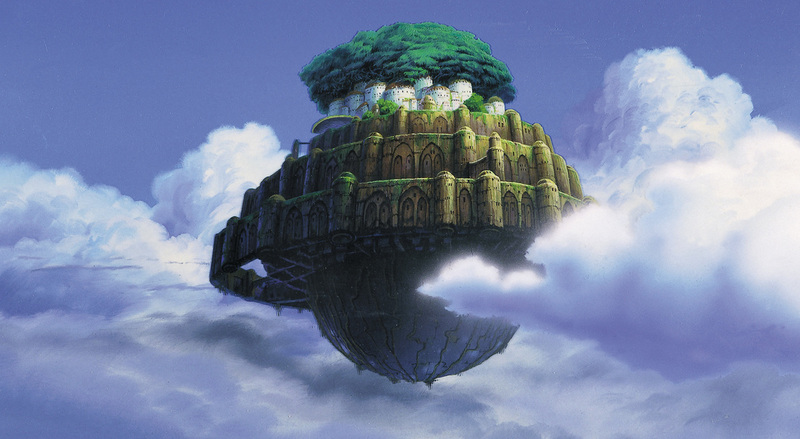 CASTLE IN THE SKY is one of many features that have turned this Japanese animation house into a world-respected brand that is up there with the likes of Disney’s Pixar. There are also many film-maker admirers, hence here the celebrity voice cast of James Van Der Beek, Anna Paquin and Mark Hamill. This sci-fi action adventure comes under the particularly interesting subgenre of steam punk. Steam punk is the name given to the art-forms (be it literature, films, television, etc. ), which are set in a parallel universe to our own, where technology is powered by steam (usually by burning coal). This technology is both more and less advanced than our own. It is as if the Industrial Revolution in Victorian Britain has had a longer reign, had a lasting impact and gone worldwide. Good examples can be seen in THE LEAGUE OF EXTRAORDINARY GENTLEMEN and Katsuhiro Otomo’s STEAMBOY. 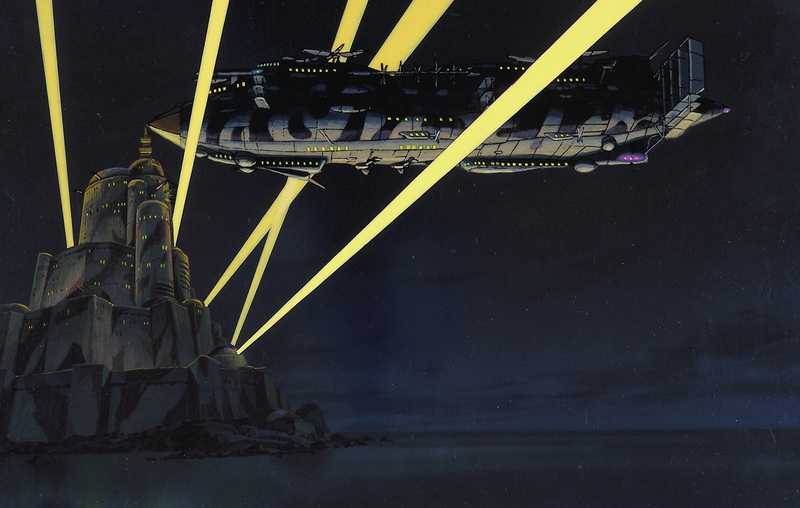 CASTLE IN THE SKY has an imaginative range of grandiose and inventive vehicles, such as huge fortresses, airships and tank-trains. 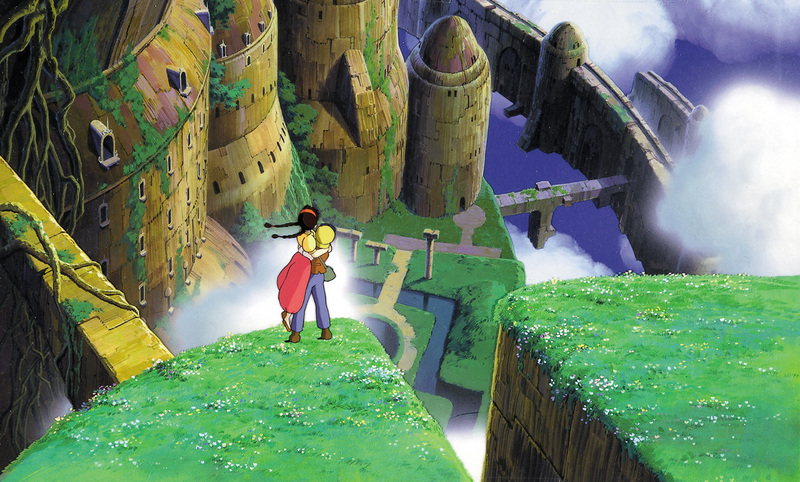 It is a delight to the mind and the eye to see Miyazaki’s designs in motion. The film starts with an action-packed opening of a pirate attack on a huge blimp high in the sky. The Dola Gang (made up a pink-haired, pig-tailed mother, and her boys) are looking for a girl, Sheeta (Paquin), who has a magical necklace. She escapes and luckily ends up in the care of a boy, Pazu (Van Der Beek) in a picturesque, sleepy mining town in a valley. Sheeta and Pazu soon become friends, but their peace is short-lived as both the Dola Gang and the military begin a chase for the necklace and its powers. 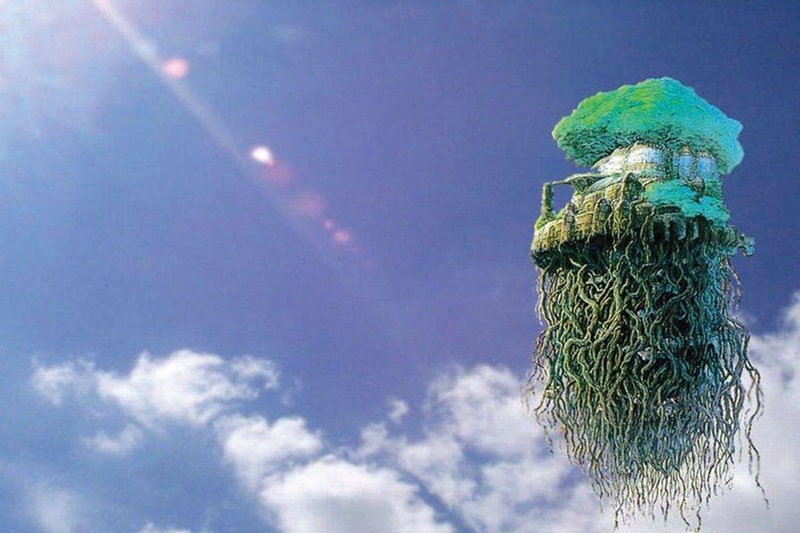 All the while the fabled Laputa, the castle in the sky, looms in the mind of mechanic Pazu, who wants to prove it exists. If I had seen this film as child I would probably have been obsessed with its high adventure (town brawls, fortress attacks and train chases), and clocked up at least a dozen viewings. As an adult the film is still remarkable. From the surreal beauty and immense detail of the images to the evocative musical score (by Joe Hisaishi), this is a film that deserves repeat viewings. How often can one say that? There is also depth to the film beyond pure entertainment. There may be a celebration of technology, but also a warning of the environmental dangers of over-mining and smog through unchecked industrial advancement. Living in harmony with the environment is a strong theme in the film. There are also the sinister forces of the military, which are portrayed as definite villains, with their greed, secrecy and arrogance. The thrills are tempered then with a melancholy at the faults of humanity, like all fairy tales. Spectacular, stunning, epic - only superlatives should be used to describe this masterpiece.